Omega-3 DHA for smarter, more trainable puppies. Targeted calcium for developing joints. Chicken, Chicken By-Product Meal, Corn Meal, Ground Whole Grain Sorghum, Corn Grits, Brewers Rice, Dried Beet Pulp, Chicken Flavor, Fish Meal, Fish Oil (preserved with mixed Tocopherols, a source of Vitamin E), Chicken Fat (preserved with mixed Tocopherols, a source of Vitamin E), Dried Egg Product, Brewers Dried Yeast, Potassium Chloride, Salt, Choline Chloride, Calcium Carbonate, L-Lysine Monohydrochloride, Fructooligosaccharides, Minerals (Ferrous Sulfate, Zinc Oxide, Manganese Sulfate, Copper Sulfate, Manganous Oxide, Potassium Iodide), Vitamins (Vitamin E Supplement, Ascorbic Acid, Vitamin A Acetate, Calcium Pantothenate, Biotin, Thiamine Mononitrate (source of vitamin B1), Vitamin B12 Supplement, Niacin, Riboflavin Supplement (source of vitamin B2), Inositol, Pyridoxine Hydrochloride (source of vitamin B6), Vitamin D3 Supplement, Folic Acid), DL-Methionine, Rosemary Extract. These guideline amounts are a starting point and your puppy may need more food depending upon age, activity, and temperament. In order to reach optimal body condition, you may need to adjust food intake. This represents the total recommended volume of food per day. You should divide the total recommended feeding amount by the number of times you feed your puppy per day to get the actual portion size per feeding. Large-breed puppies, reaching 51 to 90 lbs. at maturity, should transition to IAMS ProActive Health Large Breed Adult formula at 12 months of age. Giant-breed puppies, over 90 lbs. 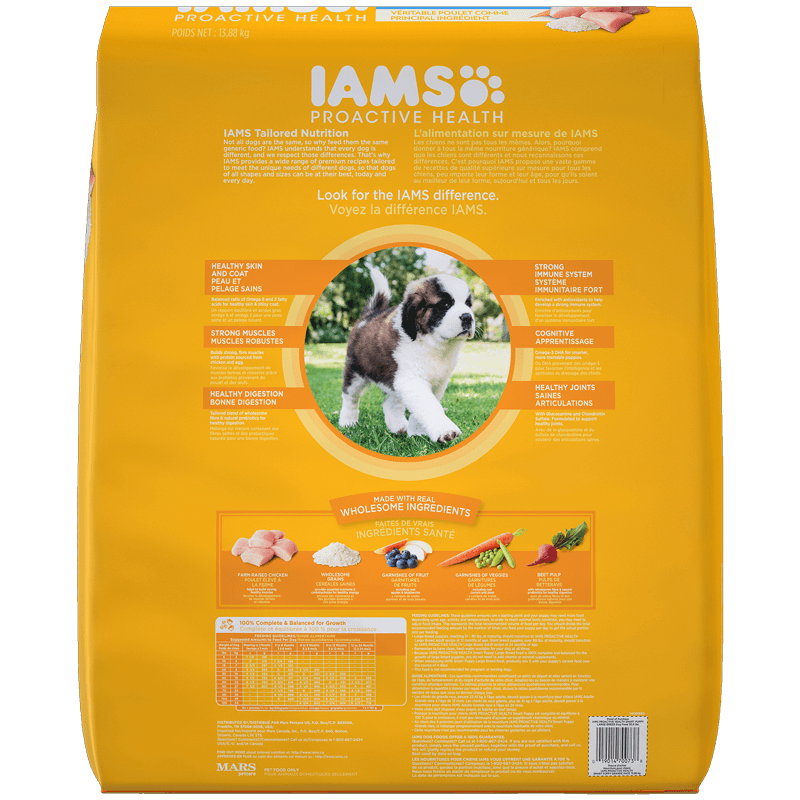 at maturity, should transition to IAMS ProActive Health Large Breed Adult formula at 24 months of age. This formula is recommended for pregnant or nursing dogs. 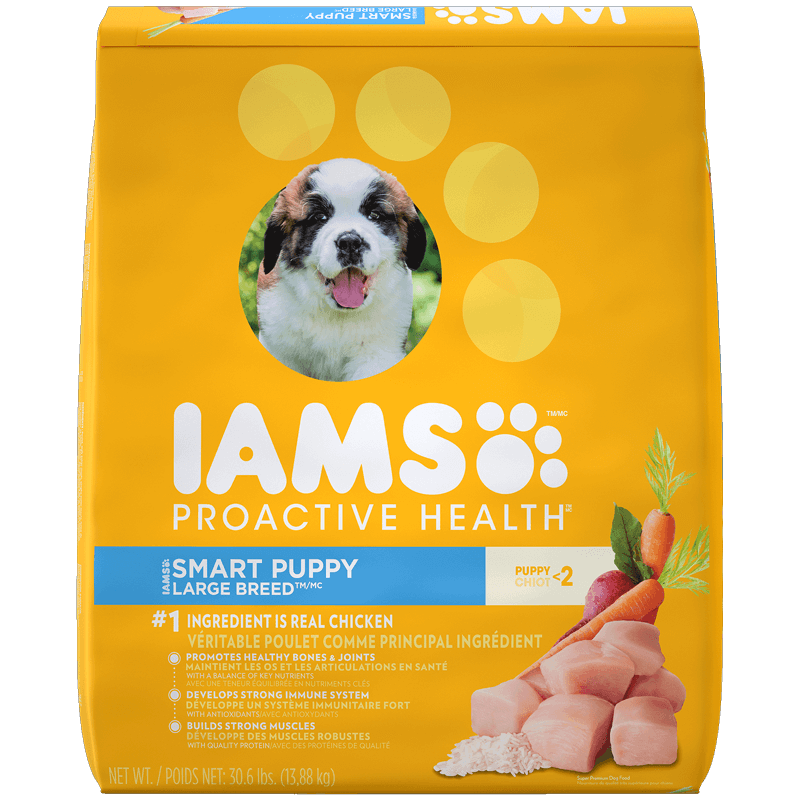 Because IAMS ProActive Health Smart Puppy Large Breed food is 100% complete and balanced for large breed puppies, you do not need to add vitamin or mineral supplements. 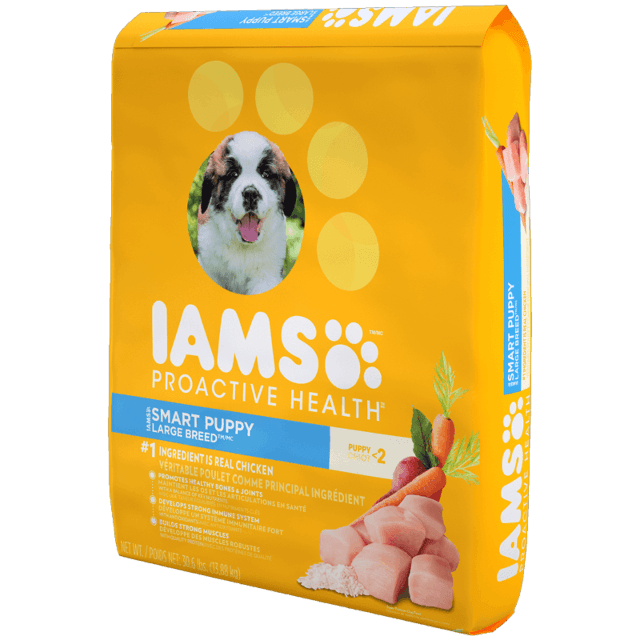 When introducing IAMS ProActive Health Smart Puppy food, gradually mix it with your puppy's current food over the course of 4 days. This food is not recommended for pregnant or nursing dogs.